After you do your business and turn around to flush, it's normal to feel a bit of terror when you notice the water level start to rise. You have a stuck toilet. A clogged toilet may be caused by toilet paper, but it's also caused by flushing other items--such as feminine products or small toys--down the drain. A plumber can be very expensive, so it's best to try to solve the problem on your own first. Unclog even the scariest messes. Warm your plunger with hot water. Run it under the sink or bath faucet. This makes the rubber more pliable. Seal the exit hole with the plunger. It's essential that the plunger completely covers the hole to get good suction. This can be a challenge if you have a large hole and small plunger. The best type of plunger has a small funnel cup that goes into the hole. Push down on the plunger three to five times. Lift the plunger up. If you've unclogged the blockage, the water will start to go down. Plunge the toilet again if you did not unclog it the first time. Double-check that you have a good seal and push down quickly. Stick a toilet auger into the bowl if the plunger isn't working. This is a long metal snake that can get rid of deep clogs. Stick the "snake" end into the toilet's hole. Turn the auger handle until it stops. You've reached your clog. Feel for the clog. You may be able to push the clog away with the auger or you can hook it and pull it up. If you--or more likely your child--has flushed a toy down the toilet, you'll probably have to pull it up. Test that the toilet is working. Once the water from the current clog starts to go down, try flushing again to make sure that it works. 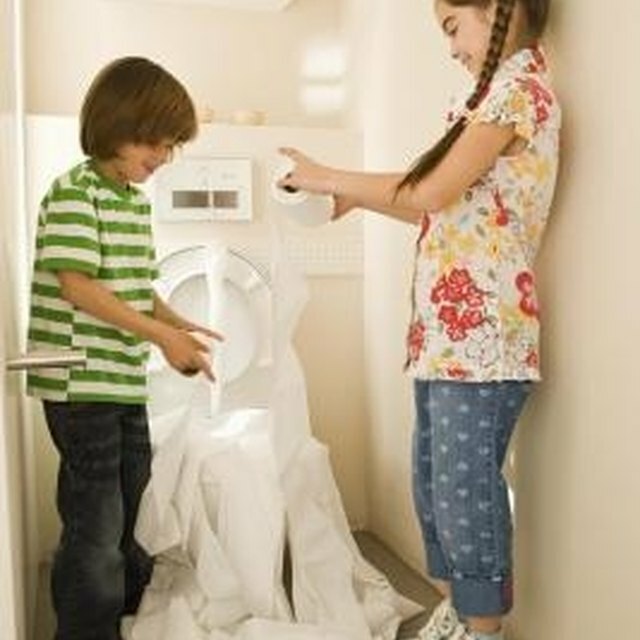 Use toilet paper to be safe. If the water is backing up into your sink or bathtub, you need to call a plumber. This is a clogged water main and you will not be able to unclog it yourself.